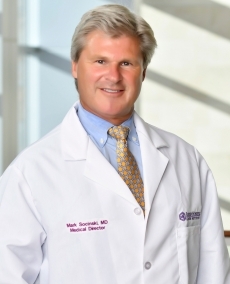 Dr. Mark A. Socinski is a board-certified, fellowship-trained medical oncologist, specializing in all thoracic malignancies, including small cell and non-small cell lung cancers and mesothelioma. He is an internationally recognized expert in the development of novel chemotherapy agents and treatment strategies for advanced non-small cell lung cancer and small cell lung cancer. His research has focused on incorporating personalized medicine and molecular biomarkers in the treatment of lung cancer. Dr. Socinski formerly served as Co-Chair of the Thoracic Malignancies Steering Committee for the National Cancer Institute. He also serves on the Respiratory Core Committee of the Cancer and Leukemia Group B (Alliance) and has been instrumental in the development of many cooperative clinical trials. He is the Executive Medical Director of the AdventHealth Cancer Institute.